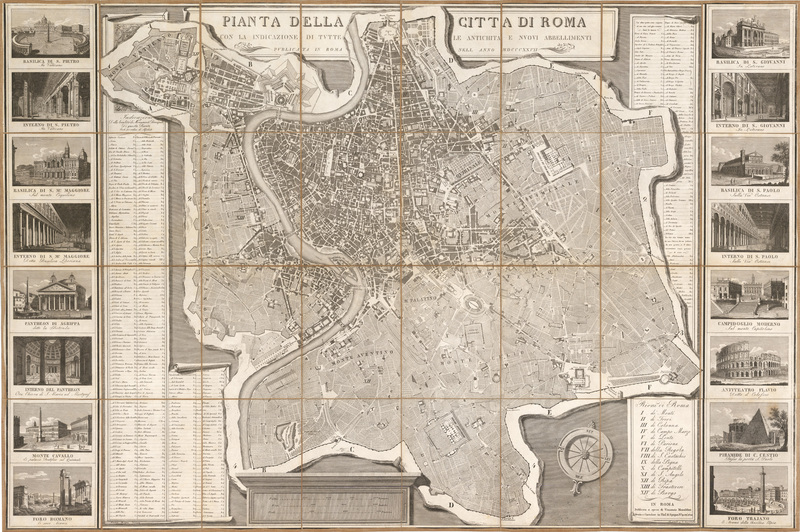 1827 Pianta della Citta di Roma... - theVintageMapShop.com - the Vintage Map Shop, Inc. The map provides a remarkable bird’s eye view of Rome and its immediate environs, including Vatican City. For anyone who has been to Rome, it’s easy to see that the streets have not changed, that one could use this map even today, for it enumerates Rome’s regions with Roman numerals following which they are named, and it includes a comprehensive coded list of the major monuments of the city. Flanking the map on either side are engravings of the most famous of Rome’s landmarks including The Pyramid of Cestius, the Colosseum, the Pantheon of Agrippa (completed and dedicated by Hadrian), and Trajan’s Column, to name a few. A large compass rose orients the map ever so slightly to the northeast.